I want us to come up with a method of humane slaughter for animals. I’m not a vegetarian. I eat meat. In fact, I used to be married to a cattle and hog producer. I think God put animals here for our use, but not for our abuse. I hate the way most meat animals are treated. Many are kept in tiny cages or small pens, and they never have any quality of life. Our animals weren’t treated this way. I guess ours were what would now be referred to as “free range.” Our livestock, however, was free range before the term became popular. Most meat animals in the South raised on family farms are still free range. We don’t have many of the huge feed lots like the Midwest does. This, however, has already been discussed in other hubs. Today I want to focus on the actual killing of the abused animals. I also want to suggest a way to save the animals from a cruel death. If you’ve never visited the business end of a slaughterhouse, you’d most likely be shocked by what you saw. I’ve been in several and have seen videos of numerous others. Most slaughterhouses do not even attempt to kill the animals in a humane manner. They’re often beaten, kicked, and shocked with electric prods as they’re forced into the chutes. This is a clear example of cruelty to animals. And it's not just the actual killing that disturbs me. I don't like how many of the animals are treated while being shipped to the slaughterhouse. They might have to go for days without food or water, crowded into trailers with barely enough room to breathe. Once they reach the slaughterhouse, they might be help in small holding pens, again without food or water, until it's time for them to face death. Surely the process can be more concerned with animal welfare! How are the animals killed? Some of it depends on the individual slaughterhouse, but cows and pigs are usually stunned with a powerful electrical shock. The abused animals are then hung upside down by either one or both hind legs, and their throats are cut. This allows the animals to “bleed out.” Supposedly, the animal is dead before it’s sent to the meat butcher, but this isn’t always the case. Animals are sometimes skinned, gutted, or dismembered while they’re still alive. Hogs are sometimes boiled alive. The slaughtering process is done so quickly that line workers and the meat butcher don’t always wait for the animals to be dead before they start hacking them up. Another method of slaughter is the captive-bolt pistol. 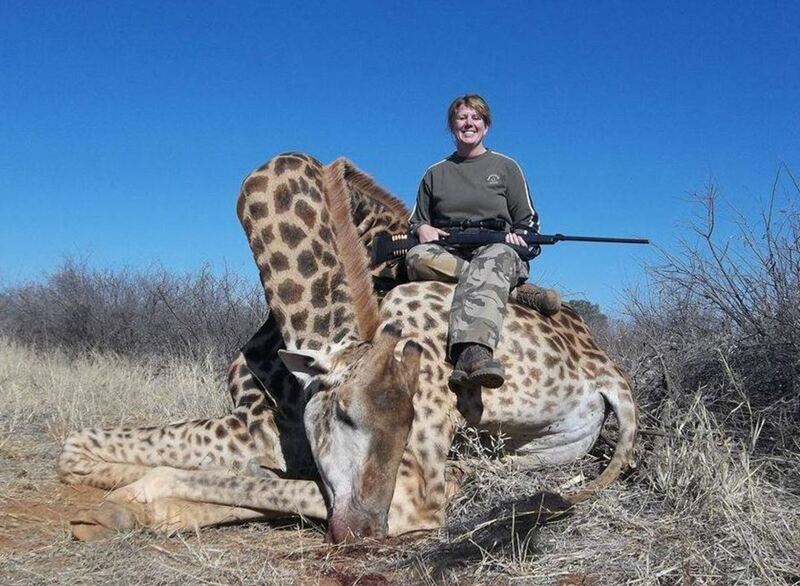 With this method, a heavy metal rod is shot into the animal’s forehead to render it unconscious. This was pretty quick and effective, but after the mad cow disease scare, the penetrating captive-bolt gun was largely discontinued. Since the rod actually penetrated the brain, brain tissue infected with bovine spongiform encephalopathy (mad cow disease) could infect other tissues once it was hit with the steel rod. Now, unfortunately, a less effective type of captive-bolt gun is used – the non-penetrating gun. This type of stunner uses a mushroom-shaped rod to deliver a powerful blow to the animal’s forehead, but it doesn’t penetrate. As a result, animals are not always rendered unconscious. And even those that are sometimes don’t remain unconscious for very long. Animals with thick hair and thick skulls are especially immune to unconsciousness from a non-penetrating captive-bolt pistol. These poor abused animals have to suffer the tortures of the slaughter process while fully aware of what’s going on. Even worse are the slaughter practices in some religions. According to kashrut (Jewish) and halal (Muslim) religious laws, the animals cannot be stunned at all. They have to be conscious at the point of death, when their carotid artery is cut. I totally do not understand the reasoning behind this! It doesn’t seem like kosher meat should be obtained this way. We usually think of “kosher” being a positive term. This isn’t the case with kosher meat, however. There just has to be a better, more humane way! Can’t we save the animals we eat from an agonizing death? Why can’t animals meant for human consumption be euthanized? I’m not a scientist, a doctor, or a biologist, so I have no idea whether or not lethal doses of drugs would affect the muscle tissue of the animal and be harmful to humans. But what about carbon monoxide? Would animals killed by carbon monoxide inhalation be safe for humans to consume? Okay, let’s just say for now that meat from a cow or pig killed by carbon monoxide or drugs is perfectly safe for the dinner table. The process would be much slower for the meat butcher, which means that the meat would be more expensive for packers to obtain and more expensive for consumers in the grocery stores. So what? I’d be willing to pay a little more for meat if it meant that the animals didn’t have to suffer the cruel practices of the typical slaughterhouse. And I know that I’m not alone here. According to Gandhi, “The greatness of a nation and its moral progress can be judged by the way its animals are treated.” If that’s the case, my fellow Americans, we’re a country of barbarians! 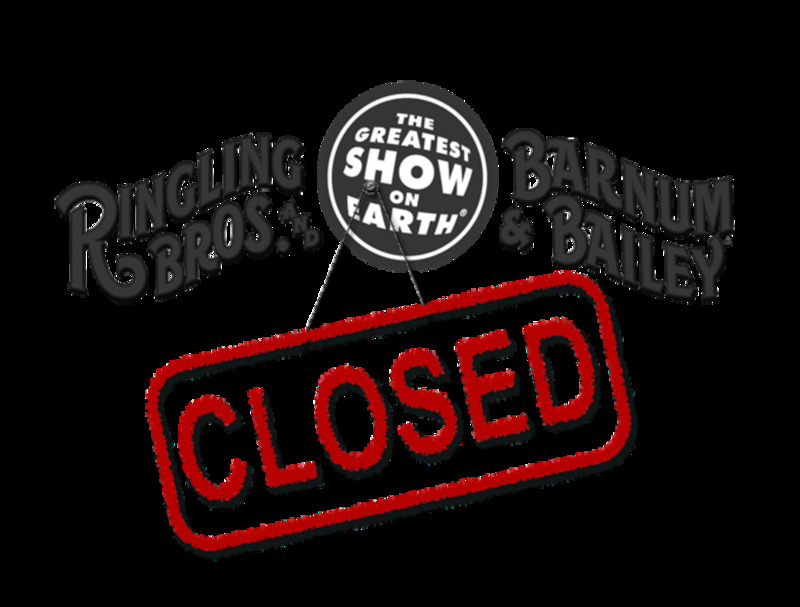 We, as Americans, are guilty of immense animal cruelty and suffering. I realize that most people don't even want to think about this as they're enjoying a T-bone steak or a barbecued pork chop, but the fact is inescapable. A lot of animal suffering and animal cruelty go into those neatly wrapped trays of meat you find in the supermarket. Surely in this day and age, we have the ability to lessen cruelty to animals with methods of humane slaughter. The end result of abused animals. All this comforting language used in the article and comments...in effect supporting the continued "growing" and taking of innocent lives...doesn't change the truth. I'd read your article about euthanizing your dear dog and thought you therefore loved all animals as much...sadly it appears not to be true. What's the dilemma? Go vegan and stop supporting the "farming" and killing of animals just as precious as your sweet dog, or don't go vegan and continue supporting animal abuse and slaughterhouses. And yes my dogs are vegan too, and very healthy, ages 7 & 14 and still playing like puppies. We use computers, etc., etc., we can use nutritional supplements, we're not out in the wild. There's no "humane" farming and taking of lives, unless you think all those billions killed to feed people carcasses/eggs/milk they don't need will be given beautiful lives and deaths as your dog had? Reality check, please. And when animals are taken "quickly" in hunting, remember, they likely have packs and families who needed them, and also that predators in nature must eat meat or die and are part of the natural order out there, and that's not at all the case for you. For us humans, vegan diets/lifestyles can be some of the healthiest out there. Also, I have a detailed, effective response to any excuses you may come up with, so don't get me started unless you want that, if I have the time. Thank you for loving/respecting your dog enough to give him a peaceful painless death. When a lion eats a zebra, or a wolf eats a deer, or any carnivore eats a prey animal, they are torn to pieces by teeth and often live though most of the process of being eaten alive. Consider that before you complain that they are killed in an inhumane way. There are easy and humane ways but the circulation would stop. The only way to minimise this cruelty is to be vegan. There are great alternatives to meat - microprotein tastes just like meat. Half the time it's the vegetarian accompaniments such as sauces and stuffings that make the meal delicious in any case. I forget to add it also has to be feed certain things such as all natural products and if possible organic. It was the quickest, most sure, most humane death that was available at that time and place. Now that there are quicker ways, some Jews and Muslims prefer those instead. @habee, thanks for the enlightening article. I just wanted to add that I found a local slaughterhouse that uses a strict "humane slaughter" policy. I've been buying beef and pork from them, but I've cut down drastically on the amount of meat I eat. I hope to eventually become a vegetarian. That is a very emotional view of the people who do this to animals but unless YOU yourself give up meat and stop GIVING your money to these people. , myself included, we are JUST as guilty. I'm in the process of giving up meat. After that I'm moving on to eggs and dairy. I found out what they do to cows. I had NO idea. I really don't get why they need to be kicked or beat, why can't they just do it quick or maybe gas? I watched one of the videos "behind the scenes of slaughter houses" it showed them slamming baby piglets head to a concrete floor it sickened me, I just don't understand why they need to be beat and caged so horrible I hope the animals revolt and attack the workers and treat them worse. Meat is not necessary. To live another does not HAVE to die. In fact, to live (longer) we can avoid meat consumption because vegetarians actually live longer than meat eaters. Luckily as humans we are able to make the consious decision to NOT eat meat but I would recommend that those who just don't want to cut it out should at least consider cutting back. I have always been a Christian all my life, I happened to turn a channel on TV and what I saw men do to PIGS, CALVES, SHEEP, COWS, I wailed and screamed to God for HELL to wait for these men unless they repent and realize in humility and what they have done inhuman to these poor animals. May God in his justice have mercy on these people who torture these animals, cut off their limbs slice their throats to leave them to die starve them to death. What we do to all animals and to people, mans inhumanity to man will be judge to the core. Anyone reading this know that you will not get away with your cruelty. You will have many years to suffer for your cruelty to these animals on earth and under the earth. May God have Mercy on you. I'm not sure about what humane method means?? God created these animals and he wanted us to use them for our benifets in a cost of treating them well. And you are trying to say that tourturing them by exposing them to high electric shock or or disturbing their nervous system is merciful? Any acute injury to the nervous system will result in a trumendus amount of pain that which will make them lose consiousness form the pain. And I don't even want to mention the electric shock. When the neck is cut and the two carotid artries are fully cut the animal will lose contiousness in three seconds and all the kicking and shivering are actually caused by a signals from the working brain to the whole body to squeez out Evey single drop of blood because the brain blood supply had stopped. This method does not involve cutting the spinal cord otherwise it will be as crule as a bullet to the head. Not making the animal move doesn't mean that he is not in pain. I don't understand why humans are trying use their limited minds to come up with things that would make the better that their CREATOR. There is no such thing as humane slaughter....!! As long as there is a market for meat....animals will keep being abused, tortured, and neglected.....!! Why eat meat when it is replaceable ??? Why propagate unnecessary pain & suffering when we have other options....?? Meat consumption is going overboard and is the source of many diseases including pollution and overcrowding...I began to be vegan 5 months ago and feel better than ever before....maybe you should try it....!! There is never a pleasant way to kill an animal but the laws, if enforced correctly, try to make it as stress free as possible. As a young pharmaceutical chemist I attended many slaughter houses to obtain samples during the process to try and identify how much stress the animals were subject to. The UK laws dictate that the animals after transportation were placed in a meadow for relaxation and out of sight, smell and hearing of the slaughter-house. The animals were then led one by one in an enclosed corridor to the slaughter man. They must not be exposed to sight, sound or smell of preceding animals and the area had to be washed to remove all traces of blood etc. The animals was expertly stunned using a captive bolt gun and bled while completely unconscious. The carcase was quickly removed to the next stage and the cleaning process repeated over again. That's how it should be done. Regrettably this was not always the case, either unscrupulous companies or inhumane, lazy slaughter-men would cause immense distress to the animals. As you say I have witnessed the most appalling treatment which was not just without compassion but actually illegal. I am now approaching retirement but for the last decade or so I have worked with Compassion in World farming to improve the conditions but fear I can do little for the disgraceful practices overseas and particularly in the Muslim and Jewish world where cruelty is excused by religion. p.s is there any way to remove the stupid childish remarks from this hub. I thought this kind of thing was reserved to the playground !! I've been troubled by this as well. I also feel that one doesn't fully appreciate that a life was taken when biting into a 99¢ hamburger. I've decided hunting is the way to go for me. Of course I'll still buy regular meat but I'm going to do what I can to get my own. This is fantastic! fantastic work! I think people need to spread this around . At the moment i'm studdying formal writing in school, and i have also watched the movie ''earthlings'' and other movies about animals getting killed cruely, out of our selfish needs, animals are made of flesh and blood, just like us, so why kill? If slaughter houses were made of glass, every bloody person would be vegeterain. I like when you write that Americans are barbarians, indeed you are, but if you want to understand why I recommend this book for you: The next hundred years by George Friedman, its very nice! Im glad that some americans like you have oppen their eyes and try to do something agains animal cruelty, I don´t know if CO method is the best, but Im sure there is a lot of methods that would work for killing the animals without any suffer. I think the only choice we have now is to don´t eat meat. Halal and Kosher slaughter is ONLY more humane if done in a very specific manner!!!! Done badly, it is barbaric. A special holding pen ensures that the animal cannot see anything. It's belly must be supported and it's head contained in a manner that does not apply excess pressure on any part of the animals body while still preventing the animal from moving about. The blade that is used must be razor-sharp with absolutely no nicks. The person doing the cutting must be well trained. A hesitant cut will take longer and cause pain. A sawing motion is also not permitted. The cut must be very fast and in one direction, slicing both the large veins, the trachea and the esophagus. There must be a halter that holds the animals throat upward but not so much that the skin of the neck is tight or slack--either conditions cause more pain during the cut. The gentle restraint of the animal's head also ensures that it doesn't move in a way that pulls or drags the cut area across any surface which would cause pain. I read these details about CORRECT halal and kosher slaughter from an article written by Temple Grandin but it was in a link in another blog and I can't find the original or I would direct commenters and habee to view it. Unfortunately, just like with regular slaughterhouses, there is cruelty that can occur in halal and kosher slaughterhouses. It would seem the only assurance that the animal suffered little or not at all is to witness the slaughter of an animal while it is hooked up to scientific equipment that measures various responses (EEG, etc.). When halal or kosher kills have been done properly the stress response of the animal is little or non-present compared to those who are "supposedly" stunned first. It does not surprise me that animals will start to be processed before they are dead. The money driven industry and the workers in these facilities give no thought to the cruelty they are inflicting. Humane treatment will cost more money and slow down the production lines! I am reliably told that there is one reason only ! and that is that if the animal is experiencing abject terror ! whilst being killed ! then certain chemicals and or hormones are released into the flesh improving it's taste. you guys are scammers those are not real comments! I often wonder about this. I think carbon monoxide should be use. Carbon monoxide is put into alot of meat anyway. Carbon monoxide is a preservative. If the cow breaths it in doesn't it get into the meat better. Thanks for posting this. I am not a vegetarian either, but I try to only eat meat that has been raised/killed humanely. It is good to have our eyes re-opened every so often. we both agree that God created animals for the benefit of man. latest scientific theories proven that electrical shocks and hitting their heads and strangeling them , causes their blood to be poisenous, and its very harmful to be eaten by human beings, and this is not the reason that God created them. the act of slaughtering when any human hears it, it sounds so cruel, because he is applying same idea of slaughtering a human being. but who told u its the same? yes they both feel ,but u cant gurantee and be sure that its same like humans, even psycholgically. The creator, who created all creatures, showed u the way, and of course he knows more because he created them and knows the best way and less pain for every creature. but always man interferes by his human mind, applying things which it might not be the case and for sure its not the same. so why we dont stop correcting Gods orders and rules,and replace it with our rules, that comes from our very limited minds. So with you on this one! I have a chicken farm near my house and just seeing how they are hauled off makes me sick! Excellent hub, and an even more excellent point. Vendla, I applaud you for rescuing horses bound for the kill houses! I wrote a hub about that, too. This was a great article, I think we should all know where our meat is coming from. I live in Colorado in a rather rural area on the Western Slope. It is very much an ag community from raising fruit, wine to sheep, pigs, cattle etc. We still have our large ranches who produce enormous amounts of cattle, which are then sent to the sale barn in the fall and end up in feed lots. However many people in our community have started on the organic road, both with the vegetables and fruit as well as cattle, sheep, chickens, turkeys. We have a number of smaller farms now producing grass fed beef, cattle which have free range and are not in feedlots, free range chickens, organic as well as eggs, lamb etc. It seems to have become a growing trend here. Yes it may be a little more pricey to buy directly from them, however, at least we know, that the animal has been slaughtered on site, has had a good life, and before I stopped eating all meat except chicken, which I raise myself. I will say that this meat that was raised this way had a completely different taste as well as their was no toughness to the meat as the slaughtering process was quick with no stress. Since I started rescuing horses, and seeing what these slaughter bound horses went through, it sort of changed my thinking on eating meat, but that is a personal perspective. However I do believe one should think when going into the supermarket, where did this meat come from, what kind of stress from the transport to the slaughter house did this poor animal endure. We need to learn compassion for all living things, especially if we want to eat them. Great article. Ica, thanks for the info. That makes me feel better about that type of slaughter. hi, thank you for the hub. i have to disagree about the halal slaughter. there has been some research that showed that it's actually more humane, because the animal is not feeling the pain when the jugular is cut, and the lose consciousness immediately. as for the stunning, sometime the animal will regain consciousness and feel more pain. before the animal was slaughtered, it should also be well-kept and given natural food (i.e. pasture raised). also, in halal, the slaughter location is separated from the other animals. the butcher is not even allowed to let the animal see the knife. using bullet or electric shock will have some brain matters contaminating the meat. Victor, my heart agrees with you. God bless you, too, Stars! Animals deserve to be treated right. Great hub. God Bless. I eat meat, too, Nancy, but I hate for animals to suffer needlessly. I eat meat but I never really thought about what the animals went through before and during their death. Thank you for this very informative hub. It really was an eye opener. Kudos to you, Run. That is awesome! I just couldn't get this article out of my mind since the day I read it. I was inspired to look for somewhere to buy meat that treated the animals at slaughter in a humane way. And I am now happy to report I have found someone! A local producer who raises and slaughters sheep, rabbits, and chickens. All the work is done in a humane way. I just wanted to get back with you, and thank you again for the eye opening article. I'm sure not only will my conscience be more at ease, but probably our diet will be healthier too! Bharat, the message is that if we're going to eat aniamls, we owe them a good life while they're alive, along with a quick death that does not involve torture. Loves to Read, it is truly sickening. Humans have an amazing capacity for cruelty to animals. Finatics, I have no doubt that fish feel pain. We enjoy catching our own fish. If we're going to eat a fish, we kill it immediately. If not, we carefully release it. I assure you that wild fish have a much better life - and death - than cows and pigs that live their entire lives crammed into some feed-out lot. When we catch crabs, we kill them before boiling them. I couldn't boil something alive. As for shrimp and oysters, I don't believe they suffer nearly as much as mammals in slaughterhouses, either. I appreciate your thoughful comments! Deb, I eat meat, too, but I still think animals deserve some quality of life, along with a quick death. King, glad you stopped by! Sorry,I failed to get the message. It seems a bit confusing to me. How can killing a creature be humane? It is like saying it is alright to kill a person but just use a bullet not a blunt knife. Killing an animal not as a necessity but due our conditioning, sense gratification and satisfaction of our palate cannot be supported. However, I do appreciate that you understand that animals do go through pain when tortured which means they are just like us. The difference is they are in a different body with a different level of consciousness. Violence should be kept to the minimum as much as possible. There will no chance of peace in this world till we keep slaughtering animals and gratifying our senses. This is truly a sickening industry. Killing meat for the big four major food outlets. As a farmer for 38 years we have always cared for our stock as they are our lively hood. But more than that they are living breathing feeling animals. A few weeks back i read one of Mickey Dee's hubs. He had a video clip about this subject. As i watched it the tears streamed down my face. I felt physically sick and asked God what kind of being could do this to another. It left me in total disbelief. Yesterday at our Church Ladies group we watched a movie on this same kind of cruelty. This is happening in California and the amount of animals processed daily is just mind blowing. I don't know how these people sleep at night. Thank you Habee for calling this to attention. habee- You'd be surprised at how much fish suffer. Scientists have done research that shows fish have the same reactions after receiving painful stimuli as mammals. The methods used to capture the fish are often just as cruel as in factory farms. Commercial fishing boats' nets and hooks usually catch animals they weren't looking for, so they're thrown overboard. In the water, they are either eaten by birds or bleed to death. In fact, around a thousand 'bycatch' die every day after they have been caught. And did you know the shrimp trawlers discard around 85% of their catch? It's unbelievable! I hope one day that people will realize the abuse these animals have been through and finally put a stop to it. I nearly just threw up my breakfast. It's disgusting how badly animals are treated- especially when it's not even necessary. There are humane ways to do it, but the slaughter houses must use the most cruel, vile methods of torture. In my opinion, the saddest part in all of this is how the animals aren't unconscious or dead while they are tortured. When the cows are hung upside down and their throats are cut, like you mentioned, sometimes the stinger doesn't even knock them out! So the cows are hanging upside down, kicking, screaming while their bleeding to death. Thank you for this informative article, hopefully somebody unaware of the cruelty of factory farming has read this and puked on their computer screen. In this modern day, it's ridiculous that we haven't stopped this already! Habee, Excellent informative Hub! You have certainly given us some things to consider? I am not quite ready to become a vegetarian but my eyes have definitely been opened! This was a real shocker what insensitivity... Thank you for sharing, Peace & Blessings! Fucsia, we can disagree on some points and still agree on humane treatment for animals. I'm moving more and more to fish because I don't think they suffer as much as mammals and birds. Sufi, I'm honored that you read my hub! I feel the same way about farm animals as you grandfather did. We at least owe the critters a decent life and a quick death. Thanks, Martie. I feel the same way when I see those animals on hot, crowded trucks. Obviously I agree ... the cruelty is non expressed only by the methods of killing, but in many other ways. The animals are now only products of commerce. You say that animals were created to be used by us, I think that they are here to cohabit with us. But certainly not to be abused! True, Sandie, but most countries are evn worse with their cruelty to animals. I want them ALL to do better! Polly - I was the same way as a kid! Scribe, those are great ideas that might just curtail some animal cruelty! True, Deborah. why does it always have to be about profit?? Thanks, Wife. I have a hub about veal! 50, I agree. Hunting is both necessary and more humane than slaughterhouses! Buckie, most of the farm animals down here are free range, too - except for the poor chickens. K, I've never considered portable units. That might be a good alternative! Eth, I saw a video about the fur trade, and it made me sick - literally. I would never wear real fur! My Granddad was a farmer and believed that if you raise an animal for slaughter, you have the duty to give it a good life and slaughter it quickly and as painlessly as possible. One nice trend that I have noticed recently is that the whole vegetarian/meat-eater debate is becoming much less of an us vs them situation. 2b, thanks for that info about Harris Teeter. Unfortunately, we don't have any around here. Hi, Jim. I guess "humane" is a relative term when used with "killing." some methods are far more humane than others. HH, a quick bullet is far better than the slaughterhouse! Yes, run, it's true. Sad, though. Charlie, when done by a responsible hunter, hunting is the most humane way of harvesting animals for human consumption. A free life and a quick death are far superior to a life of misery and a torturous demise. I hate torture, too - I wouldn't even burn a spider! Oh this is shocking! Every time I pass a truck with animals on their way to the slaughterhouse I feel terribly sad and guilty. What if they know they are going to get killed? Whatever is dead is another one’s bread – to live one has to kill - this is horrible facts of life. I was 9 when I saw how a sheep was killed. Throat cut and the sheep bleed until he died. For many months I was not able to eat meat, but eventually my father convinced me to be thankful instead of fussy. Great hub, habee! Hi, I participate in the consumption of industrialized meat, unfortunately, because I live on a tight budget. I have been aware of these types of inhumane killings, including tightly-closed quarters for chickens and the force used to test on all kinds of animals...for the past 15 years. I went vegetarian and vegan to protest, but sacrificied my health due to limited fast-food options mixed with a fast teenage life.... When I read *The Ominvore's Dillema* for a college-English class, I wrote a paper stating the FDA should regulate the industry better to ensure we are not overly-consuming hormones, our food is healthy, and animals are treated and slaughtered in a more humane way. Unfortunately, my professor gave me a poor grade on the paper, so I dropped the subject. Darn! Other than that, the U.S. has always been a bit barbaric, in my opinion!! I found this Hub entertaining. I'm not a vegetarian either and agree that livestock should be killed as humanely as possible. Thanks for sharing. Habee, a good hub, but hard to read because of the subject matter. I agree that a more humane method should be found. Mass meat production isn't pretty. On a grassroots level, we can curtail the amount of meat we eat and perhaps buy local to encourage more responsible animal husbandry by people who care about the animals they raise for meat! Just a thought. I have read that treating animals humanely while they are alive, and killing them with a humane method makes the meat taste better. I know it would make me feel better about the whole process. Unfortunately, money governs the process, rather than humanity. Most people want to pay the least amount, regardless of the condition of the animal. 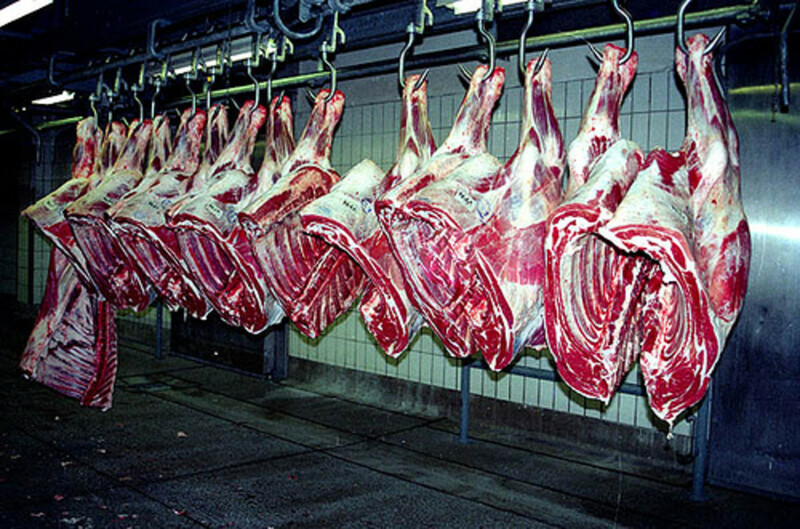 This hub needs to be front page so everyone can put pressure on Congress to pass slaughterhouse regulations. 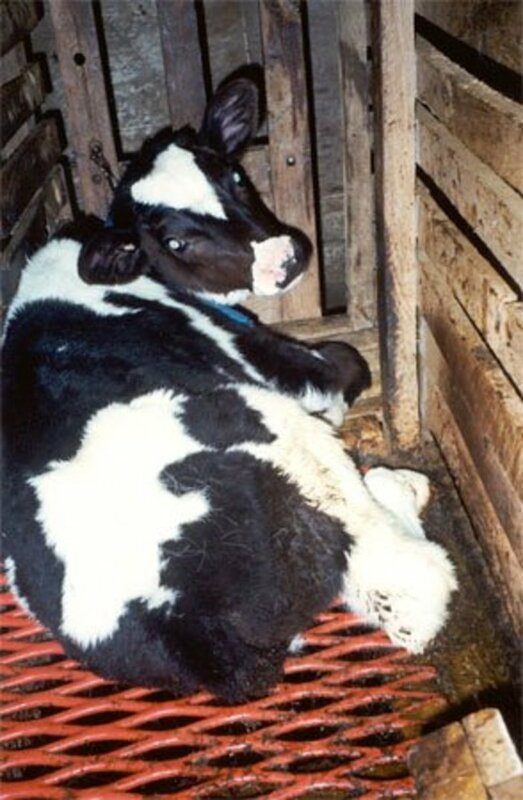 I stopped eating veal several years ago when I read that the animals are in pain from being tightly chained so they can never stand or move starting a few hours after birth. I won't even joke about them dying of natural causes. I do think the way that we raise our meat, etc. is disgusting. We passed mile after mile of penned cows through Idaho on our way to Wyoming and it made me sick. 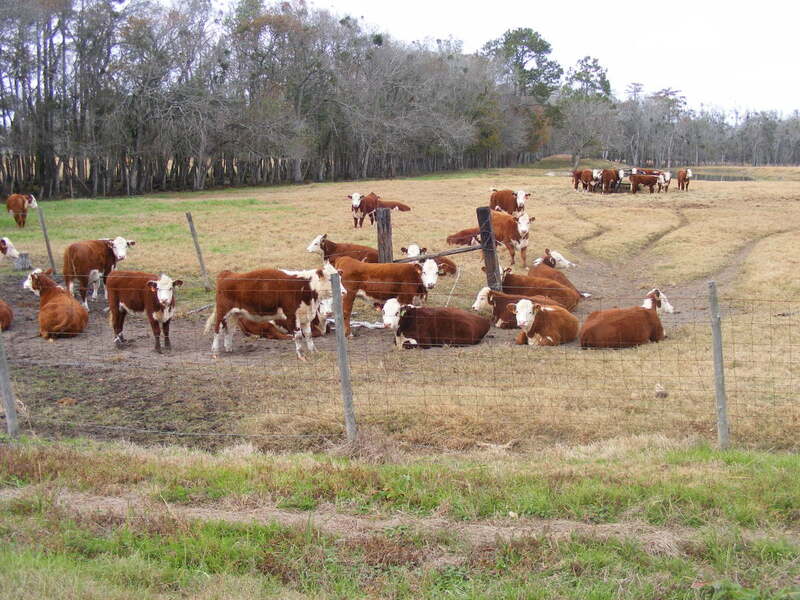 I have to say at least here in Prinetucky, everything is free range - in fact they turn several hundred head of cattle out in the wetlands just behind our house to chomp down the grass, etc. and we get the 'benefit' of their company for months on end. My dogs are still trying to figure out what kind of dog they are! Good article and voted up - cruelty on any level is just that - mean and unnecessary. I really thought that 'kosher' and 'halal' was somehow meat from animals treated more humanely than others, thanks for the enlightenment. A cow can smell the blood of their own kind injured or dying, so a kosher and halal facility must be pretty stressful. It is hard to actually stop and visualize how an animal dies, it does make you think twice about eating meat. I saw it once, the zapping gun, on a college campus, the animal didn't go completely out, they had to do it again, and I had to leave, just get the heck away from the 'demonstration'. At the same time, I remember one of my grandmothers catching a chicken in the yard and ringing it's neck and chopping its head off on the block, etc... and remember how much we all loved her fried chicken. I think it all gets back to honoring the animal, particularly the cow. They were so honored in days gone by, cared well for prior to killing, like you describe goes on still in the south on many farms. Portable slaughterhouses may be part of the answer, so animals don't have to endure any time in a feedlot or mass slaughter facility. There ought to be a more humane method in this modern day and time. They are injected with so much prior to slaughter, you'd think there was something we could inject that would stop their heart without pain, some kind of simple vitamin OD or something, that wouldn't as well hurt humans who consume. I'm with you Habee. If there is any sort of God out there perhaps those that are cruel will be reborn as a pig etc. That would be justice. 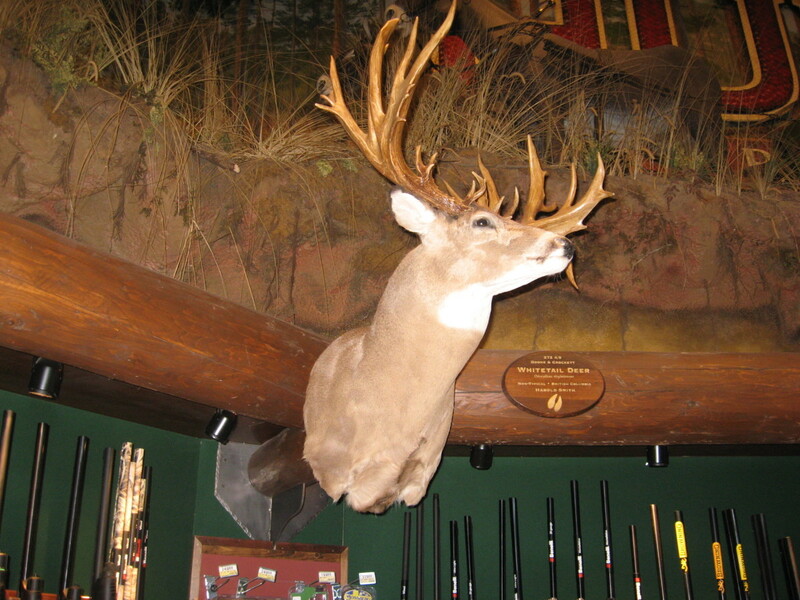 Would you write a hub about animals that are killed cruelly so that their skins are intact? I am thinking about animals that have been killed for their fur. So that the fur is not damaged they suffer all sorts of deaths including a red hot poker up their back sides. Dreadful. This troubles me to no end. To the point I have often considered becoming vegetarian. Why don't they get it? Animals have feelings and emotions. How we treat animals tell alot about us as people. Harris Teeter Supermarket only uses meat from humane farms.